“Losing weight is easy”, said the person already in shape. And why are they able to keep a body like that, while I can’t? This blog series will tackle all of the basics of getting your dream body – and keeping it. First topic – snacks to keep you full until your next meal. It can be hard to stick to your meal plan when you just ate your last meal, have 4 hours until your next meal, and are already hungry. We have the solutions. First of all, when you are used to eating at a certain time, it lines up with your circadian rhythm. This means you are more likely to be hungry at times you are used to eating at. 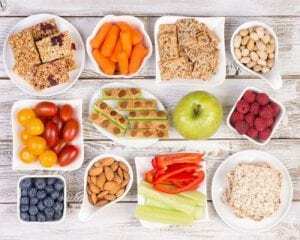 If you eat breakfast at 8am, lunch at noon, snack at 3pm, dinner at 7pm, and another snack at 9pm, it will be hard to switch to a 3 meal per day plan without your body craving foods. We have a ton of members on plans at FitEx Meals, and it isn’t uncommon for them to complain they are not getting results. That’s why we ask what their average day is like: they explain that they’re eating our meals, but will mention consuming other things throughout the day. For example: drinking coffee, adding ketchup to meals, and eating a processed snack or two – all big no-nos. This is an easy way to sneak in 200-300 calories on accident. Most of America relies on their coffee to get through the day. We suggest to use Splenda instead of sugar to keep you on track, even if it doesn’t taste as good. “But I thought fruit was good for me?” It is good for you, Karen, but it has calories! One cup of fruit usually has about 200 calories, and nobody stops at one cup. A banana alone is 105 calories. So, put down the fruit if you are having a hard time dropping the weight. This means juice, soda (besides diet soda,) alcoholic beverages (especially beer), and any other liquid with calories can sabotage you. If you aren’t sure if you can have it, check the label for calorie info. Snacking on nuts will make you fat. Again it might be “good for you” but nuts are a calorie powerhouse. If you are getting meals prepped for you containing all the calories you need, you need to stay away from nuts. One cup of peanuts contains 828 calories! If I could capitalize numbers, I would to drive that point home. That is the amount of calories in two FitEx Meals! Need I say more? So now, we have a meal plan with a calorie restriction but are having a hard time holding over between meals. Let’s explore our options. Yeah, I said it. I drink diet soda a few times per week when on a cut and I recommend it to keep you full. There are almost no calories in a diet soda, yet it has the ability to trick you into thinking you are satiated. A 2005 study linked high doses of aspartame to increased risk of leukemia. This triggered media outlets to go wild and spread that news. The problem was that the rats in the study were fed immense doses of aspartame. How much aspartame you ask? The human equivalent comes out to about 2,000 cans of diet soda per day. There is a reason the FDA allows human consumption of aspartame. Another article will come soon with all of the details of why diet soda is not bad for you. Things we recommend on your salad: Walden Farms 0 calorie dressing, cucumbers, tomatoes, carrots, light amount of onions, bell peppers, spinach, arugula, any lettuce. Yes, jerky is high in sodium, so stay away if you have blood pressure issues. Otherwise, half a bag of beef jerky is only 40 calories and takes a while to eat (for civilized human beings at least.) Jerky is mainly protein so this snack can be great if you’re trying to meet your macronutrient goal (learn more about macronutrients here). This means you eat slower, and consume less, and feel full for longer. Overall, it’s very important to pay attention to everything you’re consuming when you’re on a diet. Whether you are looking to maintain your weight, lose some fat, or build muscle, every single thing you consume will affect your progress and success. Count your calories, watch your sugar intake, and never take “healthy” foods for granted.